Another sad, sudden loss: disability rights activist and poet Laura Hershey has died after a very brief illness. The Denver Post obituary has such a lovely photograph of her, and summarizes the facts of her life and work. Laura's facebook page has become (as they do, in such times) a place for posting condolences to the family and memories and tributes. Many other blogs have been posting the news and links to some of Laura Hershey's best-known works, including FWD ("You Get Proud by Practicing"), Media dis&dat, and Victor Pineda. Visit cripcommentary.com for links to many other materials written by or about Laura Hershey. She will be terribly missed. Disability Blog Carnival #71 is up NOW! The November edition is up at Modus Dopens, and it's a good solid collection of links, around the theme of intersections. Go, fix yourself a drink (suggests the host! ), and have a read. The December edition is due to post at Rolling Around in My Head, where Dave H has invited posts around the theme "long nights and what we need to get through them," appropriate for the month with the literal longest nights (in the Northern Hemisphere), and a month with holidays that can feel like very long nights for many. Submissions are invited by December 15th for inclusion in the carnival. ETA (12/15): f you're planning ahead, January's carnival will be hosted at Butterfly Dreams, with the theme "Let Your Freak Flag Fly!" Go over to the call for submissions for elaboration on that, and instructions for submitting links. Thanks as always to hosts, contributors, readers and commenters, for making the Disability Blog Carnival happen (now heading into our fifth year--first official edition was October 2006). I'll be posting another call for hosts in the new year, so think about whether you'd like to have a turn in 2011. Students working on topics concerned with the complex and multifaceted geographies of disability, aging and chronic illnesses are encouraged to submit a paper to the 2011 AAG Disability Specialty Group Student Paper Competition. The successful student will receive a cash prize of $100. The award is named after Todd Reynolds, Ph.D. (1971 - 2008), a scholar with disabilities who pursued important research in human behavior and hazards geography - In Memory of Todd Reynolds blog. The goal of the award is to encourage student participation in the specialty group and to recognize outstanding emerging scholarship in geographic research on aging, chronic illnesses and disability. Eligibility criteria: Papers prepared for publication, conference presentation, and graduate or senior undergraduate courses, as well as entries written specifically for this competition, are eligible for submission. Each student may submit only one paper. The student should be the lead contributor to the paper if it is co-authored. Students do not have to be a current member of the DSG or AAG nor must they plan to attend the 2011 AAG conference to submit a paper. International submissions are welcome. The paper should not exceed 25 double-spaced pages (including all notes, references, and figures). 12 point font is preferred along with standard margins. Students considering submitting are advised to contact student paper competition coordinator Ryan Parrey by e-mail in advance. He will also gladly address any questions or concerns regarding participation in this competition. Award notification: Reviewers will be secured and their recommendations will be sent to the DSG Board for the final award decision.The award recipient will be notified shortly after the 2011 AAG annual meeting in Seattle, Washington - more information. The check will be mailed to him/her shortly thereafter. Post-conference announcements will be found on the DSG website and the GEOGABLE listserv, as well as other appropriate venues including the Disability Studies, Temple U blog. humour? Does humour run the risk of attacking the seriousness, and thus the legitimacy, of disability rights? Or does it have a part to play in the struggle for such rights? How is disability playing out in the current vogues for satirical comedy and the comedy of embarrassment (e.g. “Curb Your Enthusiasm” and “The Office”)? This special issue of JLCDS will explore the interplay between humour, impairment and disability across all forms of culture and the media. Submissions might consider representations of disability in particular texts or specific forms. Alternatively, they might examine disability theory in relation to humour theory. Submissions on all topics related to disability, humour and comedy are very welcome. Considerations of the impact of “political correctness” - the policing of what can and cannot be made funny - as well as the impact of “critical correctness” (Mallett, 2007) - the policing of what can and cannot be said about humorous/comedic representations of disability -are encouraged. We urge submissions to think the unthinkable and address the difficult questions. Proposals should be emailed to the guest editors tac7@le.ac.uk or R.Mallett@shu.ac.uk by March 1st, 2011. Final submissions will be due by October 2011. Next TWO Disability Blog Carnivals are Announced! Carnival edition #71 will be hosted at the blog Modus Dopens, where Irrational Point invites you to submit your own or others' recent writing on the theme "intersections." If you have a link to share, email it to Irrational Point according to the instructions over there, by November 18, and watch for the Carnival to post sometime soonish after that. Meanwhile, for your disability-related carnival-going needs, check out the very first Assistance Dog Blog Carnival, just posted last week! It's big, and it even has a cute button. ETA 11/8: Dave H. has posted the specifics about December's Carnival edition #72: "Rolling Around in My Head will be hosting the December issue of the Disability Blog Carnival. I've tossed around various ideas for the blog and have decided to post it on December 21st which is the winter solstice and the longest night of the year. Therefore I've chosen the theme to be 'long nights and what we need to get through them' ... I've sure we've all had seasons of darkness and despair, hours of bleak desperation, I'm hopeful that people may have stories of what it took to get them through those times. Hope? Strength? Courage? Whatever it was, there's a story there to tell. Please have submission links to me by the 15th of December. Email me at daveandjoe@hotmail.com with blog carnival in the re line." 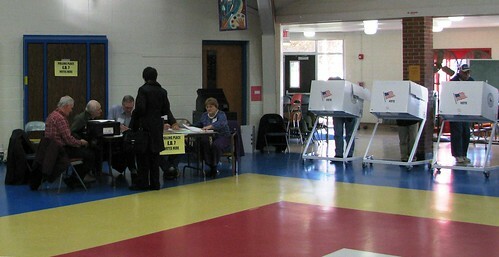 Voting (N.Y. Election District 7), originally uploaded by Edu-Tourist. I hope all of our readers took time out of their busy schedules today to vote in this important midterm election. Feel free to use this stem to post your observations. Who do you feel has your back? How was your experience at your local polling station? What are your hopes (or fears) for the future? The deadline for submissions to this conference is Friday 5 November, so if you're interested, there's no time to lose! The conference Picturing Women’s Health 1750-1910 will explore the interface of diverse discourses that constructed ideas about women’s health during the Romantic and Victorian periods. In these years, writers and artists documented extraordinary discoveries and advancements in science, anatomy, and medicine. This inter-disciplinary and multi-disciplinary conference will examine the vicissitudes of attitudes towards women’s ‘healthy’ and ‘unhealthy’ bodies over the one-hundred-and-sixty year period. In particular, conference papers will consider representations of the female body in fictional/non-fictional literature, fine arts, and visual media and how they reflected or influenced women’s understandings and experiences of their own health and bodies. How did different women’s testimonies or documentations of health relate to each other? How accurately or inaccurately did men and women artistically portray the female body in health and illness? How were scientific and artistic ideas about women’s health in dialogue? What is the relationship between the representation of woman’s body and her (in)ability to perform certain familial and social roles? How are contemporary critical debates on Romantic and Victorian public and private spheres complicated by the periods’ representations of women’s health? Submit an abstract of 250-300 words for a 20-minute paper either by the online form at the website, or to womenshealth.2011@gmail.com, with your name, affiliation, e-mail address, and title of paper. The history of the body has been a locus of prolific research in the past several decades, engaging scholars from disciplines as diverse as history of medicine, cultural history, literature, sociology, and anthropology. The body's experience of health and sickness, histories of the senses, changing standards of civility, the body as political instrument – these and other approaches have recovered the centrality of the human subject in studies of the past and present. Yet current scholarship on the body often relegates issues of space to the background, treating it as a neutral setting against which bodies interact. Conversely, treatments of the body and its history are scant in disciplines focused on space and the built environment. In fields like architectural history, geography, and urban studies, the presence of the body is taken for granted and its history rarely emerges as a critical contribution to the history of space. -What role does the built environment play in our understandings of the body? -How have past regulatory practices of the body influenced the design of spaces? -How can we reclaim human agency while acknowledging the limits imposed on the body by spatial constructs? The Body in History / The Body in Space Graduate Student Symposium is occurring in conjunction with Cambridge Talks V, an annual conference dedicated to the exploration of interdisciplinary topics that engage issues of space. We welcome paper proposals from graduate students in various fields and disciplines. Proposals should include an abstract (500 words) and a brief CV. Materials should be sent to cambridgetalksv@gmail.com by Monday November 22, 2010. Authors will be notified of acceptance by December 15.